Before returning to men's short track after a brief break, let's reminisce. Who doesn't remember the infamous Vancouver 2010 kiss between these two? Canadian sweethearts! @VanessaFernandes: One of my favourite moments from Vancouver 2010! 1st Semi-final group on the ice! Top 2 finishers will make it through to the A Final. St. Gelais crosses the line in 4th position. Waiting for official results. Marianne St-Gelais is eliminated. Park and Fontana move on to the final. It was shocking to see Fan fall, very uncharacteristic. She was a definitely considered a medal favourite. Ladies 1500m heats under way! Keep it here for up-to-the-minute updates! Drolet from Canada on the ice. 2:24.859 for Drolet, she has qualified for the Semis! she crosses the line 2nd. Official results to come. 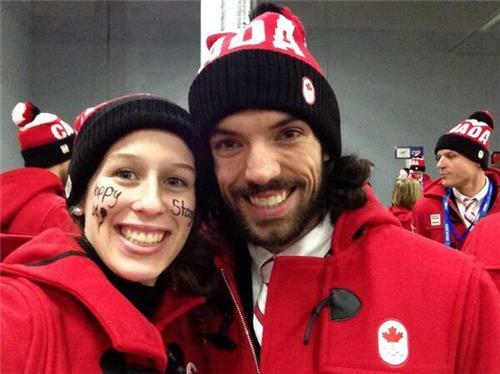 Vanessa checking in here from Canada Olympic House...the house is buzzing with the Men's Hockey Team here for lunch. But all eyes are on short track taking place RIGHT NOW. AN (RUS) and Knegt (RUS) advance. Charles finishes 4th. Olivier Jean is up for now.....i miss his dreadlocks.